As Ronnie Apteker's latest movie, Material, is about to enter the circuit, the reviews are glowing with praise. KHADIJA PATEL talks to the man in the centre of the action, Riaad Moosa. I find Riaad Moosa on a Sandton sidewalk, impatiently waiting for a download to complete on his iPhone. He’s also looking for a lift. I dutifully oblige. We weave our way through the lunchtime traffic, making our way to the offices of United International Pictures (UIP), chatting amiably about theatre, a chance meeting I had with his sister and the other. His film Material had premiered in Johannesburg the previous night and I was eager to find out if he had overcome an anxiety that the film would earn him a fatwa. “I’ve still got major anticipatory anxiety,” he tells me. At the offices of UIP, we sit down to an interview. I’ve already watched the film and tried my best to assure Moosa that he had not done anything to enrage the crazies. At least not this time. I do understand his fear though. It’s not altogether a reservation about the film’s content, but rather a nagging worry about the tropes of artistic expression. I assure him again, he has nothing to worry about. It’s a beautifully made film in which Moosa plays Cassim Kaif, a young Muslim man who works in his father’s fabric shop in Fordsburg, Johannesburg. As tradition dictates in this part of the world, Cassim is groomed to take over the family business from his father. As a dutiful son, he has not considered any alternatives. The shop is his life and his destiny. Until one night, through a series of coincidences, he lands up doing an open mike session at a local comedy club. He discovers a hidden talent for comedy and is encouraged to continue further along the comedy path forcing him into conflict – not only with his father but also other family members and some elements of his community. The film lends historical significance through its storyline of conflict between Riaad Moosa’s father in the film, played by Vincent Ebrahim, and his brother. Their conflict was founded when shopkeepers from Fietas – one of the oldest communities in Johannesburg, and one of the first ‘locations’, or multi-racial areas established under the government of Paul Kruger in 1893 – were forcibly removed by the Group Areas Act. Until then, Fietas was an integrated community, not unlike District Six and Sophiatown. Many of the shopkeepers who lost their livelihoods in the move from Fietas to Lenasia, ended up at the Oriental Plaza, the shopping complex in the heart of Fordsburg, now famous for bargains, samoosas and a plurality of fabric stores. And the story of the film goes, Vincent Ebrahim’s character was affronted by the readiness of other shopkeepers to sell out to the apartheid government and go meekly to the Plaza. His brother however has no such qualms. And it is this richness in the story telling, the attention to historical detail that sets this film aside from other efforts to represent the Fordsburg community in all its beguiling eccentricity. It’s regrettable that a film about a South African Muslim family fails even to win over the star’s reservations of artistic licence and creativity within the Muslim community. This is not a film about the backwardness of Muslims. It does not portray Muslims in an unforgiving light. Instead, it shows an aspect of Muslim life in South Africa rarely seen before. Away from the bombs of Baghdad and the schizophrenia of Pakistan, this is Johannesburg, South Africa, and this film reminds us that though Muslims are easily wound up into fits of self-righteousness, they are human too. They share the same physical space as other South Africans. They share the same experiences. He’s experienced some weird reactions to the film so far. Putting on his best impression of a Sandton kugel, he says, “I just realised Muslims are people like everyone else. I identified.” While we enjoy a chuckle he says, “It’s not just anyone saying these things – intelligent people are saying these things. It is strange but it’s the thing with these themes that are pervasive and you get bombarded by one kind of image and then you are confronted with something that is just a lot more real. In that sense you can understand this reaction, but it’s just still so strange,” he says while his face creases into a thoughtful furrow. A peep behind the veil in The Witness. The material difference a small, breakthrough movie could make to SA cinema in Daily Maverick. Joburg glitterati grace movie premiere in The Star. Fordsburg’s cultural mix in IOL Travel. 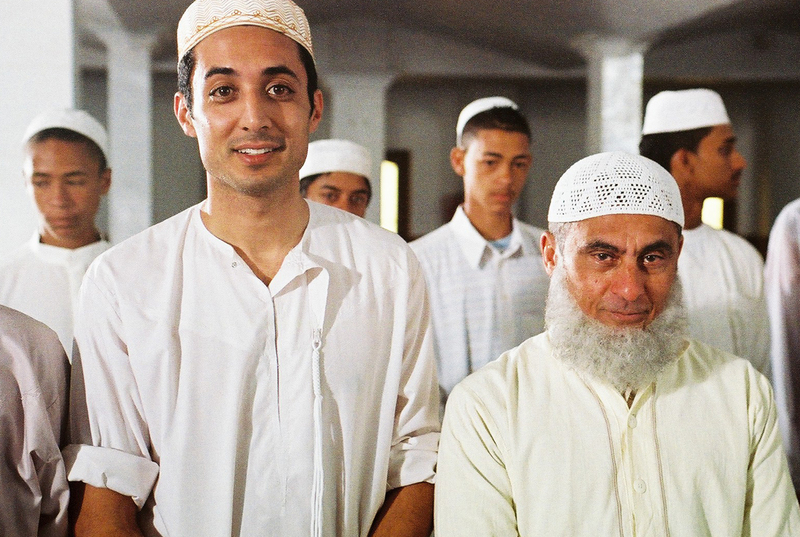 Photo: Riaad Moosa plays Cassim Kaif – a young Muslim man torn between tradition and comedy. UIP.